Calculates which side the robot is tilted or is getting more power. 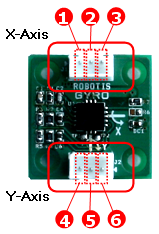 Maintains the robot’s balance and can be used for other movement applications. ADC : Outputs the angular velocity into analog signals. ADC : Outputs the angular velocity value into analog signals. When the angular velocity is 0 (when still), the output value is approximately 250. When it suddenly turns to one axis, the max value output is 455 and the minimum 45, showing a 300 ˚/s angular velocity. Here the mark or sign represents direction. Depending on the temperature, there may be 1% difference. There may be a difference in value depending on the standard VCC voltage value and circuit noise. Thus, we recommend to average several values before use. 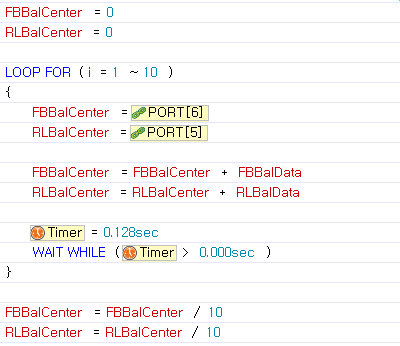 You can READ the value using the User’s Device Parameter in RoboPlus Task. You may sample it out like below. It reads 10 values per 0.1 sec and makes an average. This value can be used as the standard value.